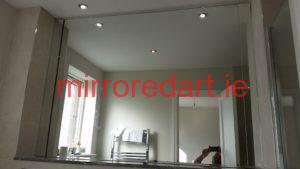 Design, Manufacture and Installation Service. 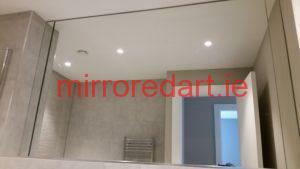 Mirroredart.ie is a Dublin firm that specialises in the design and manufacture of custom-made Mirrors, and genuine leaded Stained Glass windows, doors, skylights, glass shelves and other glass products. Our designer involves the client from the initial design conception to the final fitting. 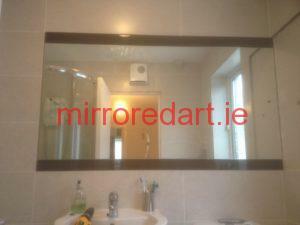 Full wall mirror with de-misting heat pad ,for house in foxrock Dublin. Bathroom mirror.full wall main Bathroom foxrock hall showhouse. 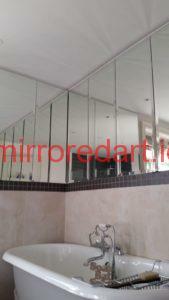 Full wall mirror for bedroom ensuite Adelea Clonskeagh Showhouses.